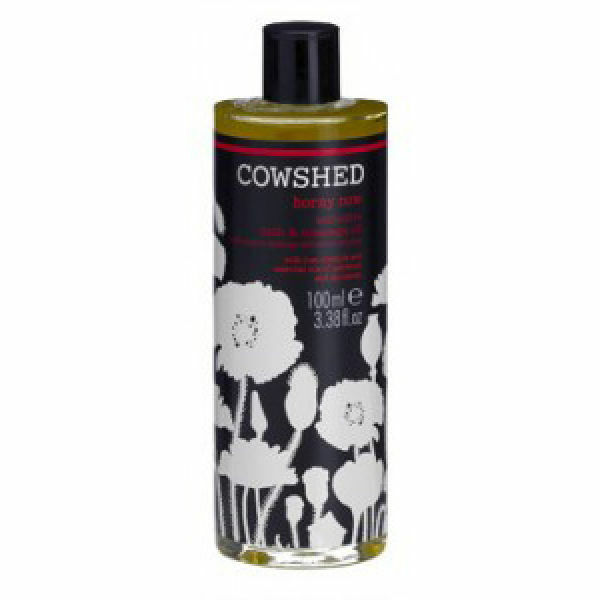 Horny Cow Seductive Bath & Massage Oil is a floral, spicy blend with Rose Absolute to heighten romance and essential oils of Patchouli to arouse desire and Cinnamon to stimulate and warm. Evokes your sensuality and passion. The minerals, vitamins and proteins of Almond oil naturally nourish the skin while Calendula (Marigold) rejuvenates. vitis vinifera (grapeseed) oil, prunus amygdalus dulcis (sweet almond) oil, sesamum indicum (sesame) oil, glycine soja (soya) oil, calendula officinalis (calendula) flower oil, ***cannabis sativa (hemp) seed oil, vaccinium macrocarpan (cranberry) seed oil, parfum (Cowshed fragrance formula), *cinnamomum zeylanicum (cinnamon leaf), *pogostemon cablin (patchouli), *rosa centifolia (rose absolute). **hexyl cinnamyl, **benzyl salicylate, **linalool, **limonene, **hydroxycitronellal, **geraniol, **citronellol, **a-isomethyl ionone, **butylphenyl methylpropional, **hydroxyisohexyl 3-cyclohexene carboxaldehyde, ** eugenol, **benzyl benzoate, **cinnamal, **cinnamyl alcohol.